Win 4 Tickets: The WannaBeatles (Boca Black Box- Boca Raton). * This contest started on 9/13/17. This contest has a winner. * Win 4 Tickets: The WannaBeatles (Boca Black Box- Boca Raton). Jeff Eats got 4 tickets to give to one of you guys to see- The WannaBeatles at the Boca Black Box in Boca Raton on Friday, November 17, 2018 at 8pm. How many Beatles’ tribute bands can you name -who’ve been nominated for a Grammy Award? Jeff Eats and Mrs. Jeff Eats have seen the Nashville based- WannaBeatles and not even one band member wears a wig or speaks with a fake British accent…What you get- are four extremely-accomplished musicians in a fast paced interactive show- recreating The Beatles’ hits exactly as The Fab Four recorded them! This Grammy nominated tribute act use comedy, song, and audience participation to create a totally different kind of Beatles experience. 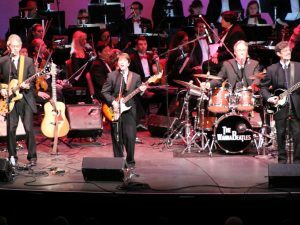 The WannaBeatles, who have appeared on national television, will bring their multi-instrumental skills to Florida where they will re-create all your favorite Beatles songs and much more. This year also marks the 50th anniversary of the release of “Sgt. Peppers Lonely Hearts Club Band” as well as 1967’s “Summer of Love.” The WannaBeatles will bring back memories with renditions classic hits from that magical musical time. Come join the “Ultimate Beatles Tribute Band”. It’s going to be a happening! Just bought 10 tickets for the show. Saw beatlemania like 4x huge Beatle fan!! Odds worked for me on this one. 11-30 not bad. Can’t wait to see the show.